Yay! Here is another easy deal you can score at Target this week! 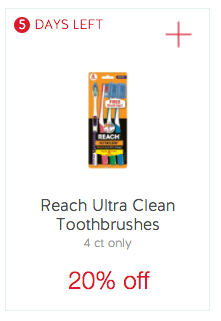 Through 5/13, Target has the Reach Ultra Clean Toothbrushes, 4pk on sale for $2.49. There is a 20% off Reach Ultra Clean Toothbrushes, Target Cartwheel Offer, exp 5/13/17 available making these just $1.99 or $0.50 per brush, easy deal!